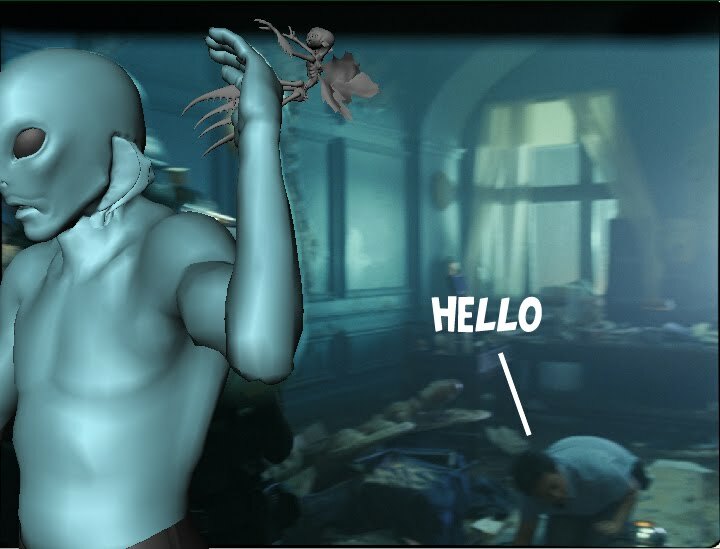 I found another playblast of a Hellboy 2 shot I worked on so thought it would be fun to show it here and also explain how it was done. 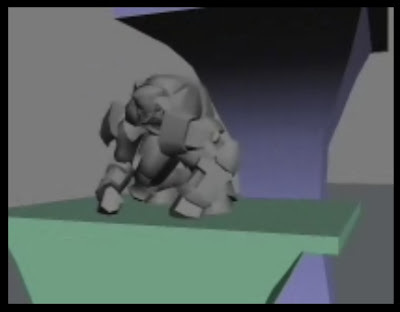 Playblast of the Hellboy Rolling Statue from Brendan Body on Vimeo. 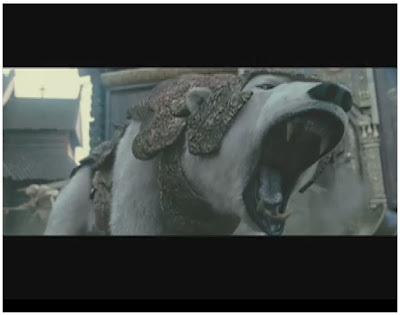 It's from the film's 'Tooth fairy' sequence. The first half of the movie is the playblast, the second half is an early comp with basic textures and lighting, a first pass at the background 'swarm' fairies and a few of the other effects. There were several narrative points that had to be addressed in this shot. In the first part the director Guillermo del Toro wanted the rolling statue covered in squashed Tooth Fairies, this had to then reveal a mass of dead and dying Tooth Fairies, twitching and writhing around. 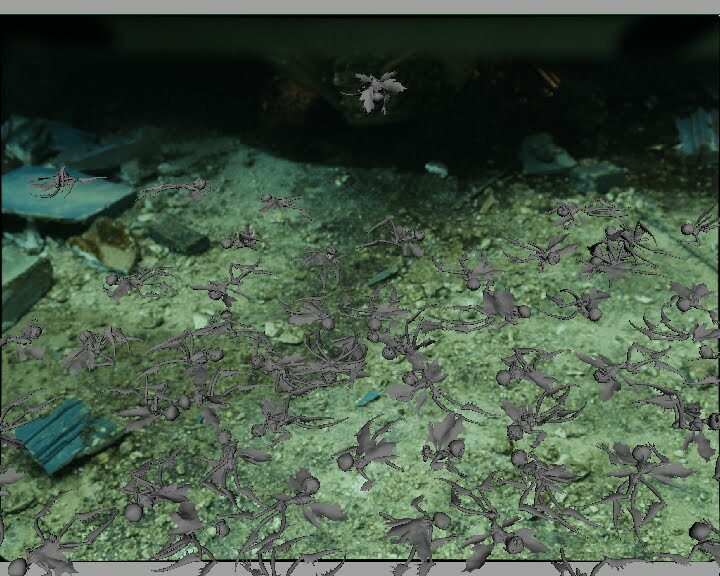 I approached this by first creating a library of cycles that I could reuse quickly and easily to create a moving carpet of the creatures. Above I've named the cycles and shown how they were applied ... as best as I can remember. Face Up 1, Face Up 2 and Face Down are cycles I kept predominantly still but with some random spasms and twitches. Twitcher - Flails around, letting out an agonising scream then finally relaxes and coils into his death pose. Kicker - is based on an insect video I found on youtube. The idea is that the dead insect's nerves keep his legs kicking, this drives his body round in a circle. Crawler - with his legs and one arm badly injured, this fairy pulls himself along by his one good arm. The rigs also had a clever function - a series of blendshapes that could be dialled in to give the effect that a leg or arm was missing. 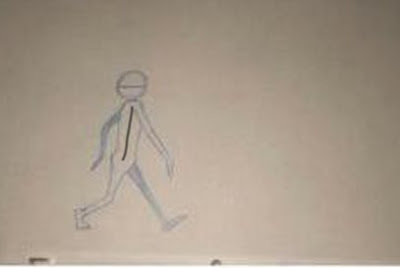 There were also shapes that got rid of everything but the chest, head, or hips and legs. This meant I could quickly and easily make the cycle look very different by removing half the fairy, or could superficially make a cycle look distinct just by removing a few legs or an arm. I populated this section of the shot with these characters, then tried to create 'hero' tooth fairies to give the viewer interesting things for their eye to settle on ... and also to amuse myself. There was a platform in the top left of frame so I placed a hero 'kicker' on there - he drops off the statue then feebly kicks himself in a circle. In the centre of the picture, '2' drops off the statue into frame to draw your eye into the picture. 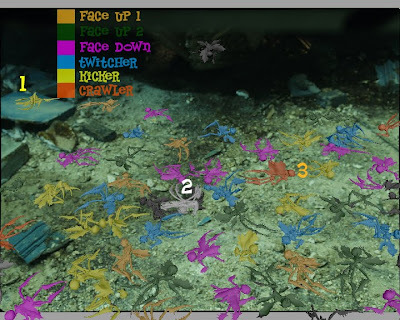 '3' - a badly injured 'crawler' drags his torso forward leaving the rest of his body behind. The next level of Fairies had to interact with the characters, these were some of the most fun to do. They are lead by the actions of the actors who are miming being attacked by the creatures. 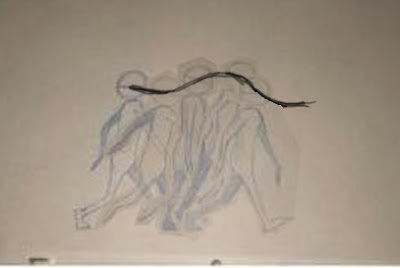 It was then my job to find a series of movements that would fit the actions performed. 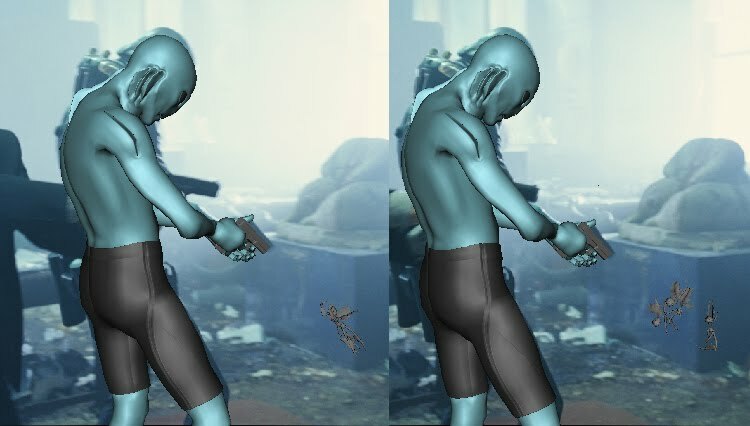 For this to work convincingly, the characters movements have to be rotoscoped onto CG doubles. My memory's a bit hazy here but I think I did both Hellboy and Abe in this shot, (apologies if it was someone else). 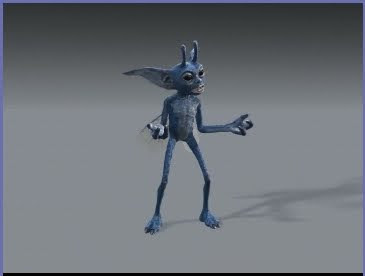 Double Negative had a neat little tool that made it easy to constrain the Tooth Fairies to the geometry of the CG doubles and it could be easily animated on and off as they landed and then took off or got hit. There are four of these 'attacking' Tooth Fairies in the shot, two on Abe when we first see him, one who lands on Hellboy, and one much later, and you'll have to look very closely for this, on Abe's leg when he is on the stairs - Abe sweeps him off, he hits the banister and bounces back onto the stairs and is then stood on. I'm always impressed by actors who can convincingly mime such actions with nothing to guide them, it also makes the animator's job a lot easier. The actor who plays Abe, Doug Jones, is awesome at this, I hope to write a post on just this soon. 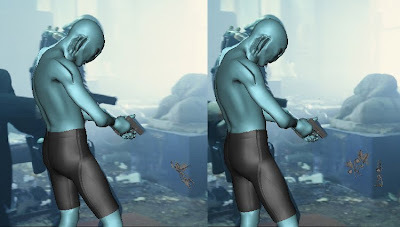 The next level of Tooth Fairies are the ones that are to be shot by the various characters, you'll notice in the playblast in the top video that the gun blasts are absent. It was up to me to work out when the best and most appropriate time for the gun to go off. Again much of this is driven by the performance of the actors. To create exploding fairies I was able to use the limb removing blendshapes I mentioned before. When a fairy is shot his visibility is switched off, at the same time several other fairies appear with their various parts hidden, they are then scattered to create the impression that the fairy has exploded. The effects department then added in some liquidy gloop to give the fairies a nice splat too. 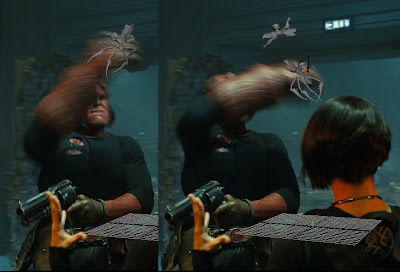 I also used this technique for the fairy that Hellboy swipes, I thought that since Hellboy is supposed to be incredibly strong it would be good to have this one disintegrate with the impact. Each rig in the scene slowed it down so I tried to be as efficient as possible with my Tooth Fairies, you'll notice many of the attacking, or being shot in the background swoop past camera to get extra value out of them. Amusingly, in the first playblast a member of the on set crew also makes an appearance, he was painted out in in final plate. 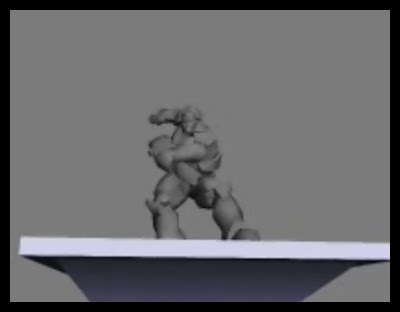 Hellboy Rolling Statue Sequence from Brendan Body on Vimeo. Here is the finished shot. 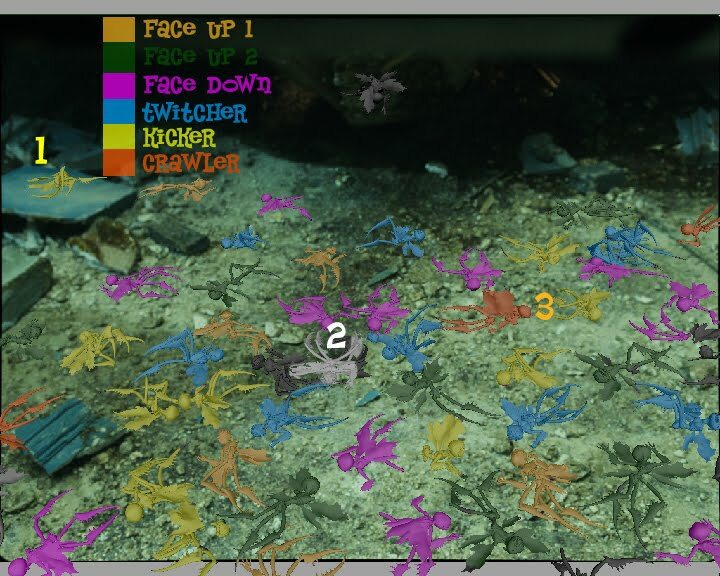 As you can see many extra effects have been added - the swarm stuff is awesome as is the fire and tooth fairy blood and goo, on the ground around the dead fairies. 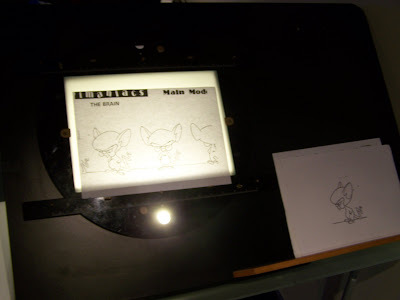 Animal Logic colleague and friend David Williams, has a great blog called The Animator's Buffet, David has an immense knowledge of animation history and has dug up some fascinating and varied examples to show, as well as including his insightful observations about them. Also, I've recently added a 'Followers' gadget to the sidebar of this blog. If you find my online ramblings interesting you can now click "follow" there to be notified when I've posted something new. Many thanks to those who already have. Breathing is not something we are often conscious of, therefore animating a character breathing during dialogue is easily overlooked. Spending the time studying and adding this to your shot can really create a great sense of believability to your work. In fact, as we'll discover, breathing is something that can be used to drive a performance. We first should take some time to understand how breathing works and what controls it. Breathing, as I'm sure you're aware, is the expanding and shrinking of the lungs. This is primarily driven by the diaphragm which contracts, moving down and pulling air into your lungs, then during the exhale the diaphragm relaxes, moving up and expelling the air from our lungs. However, this is not the only force acting on the lungs. There are muscles around the ribs which contract, expanding the rib cage by swinging the ribs up, then on the exhale they expand and the ribs swing down causing the rib cage to get smaller. 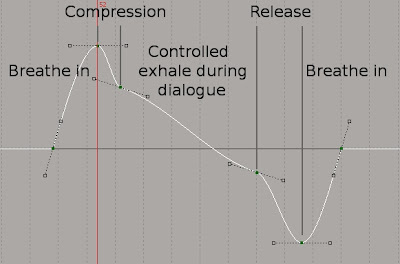 I've used a 3d animation package to create a graph which represents how lung volume changes during a typical breath taken when at rest. The air fills quickly at first then slows as it reaches the apex, on the exhale, the air leaves the lungs quickly at first then slows as the lung volume reaches it's lowest point. However when we speak, our breathing pattern is very different. 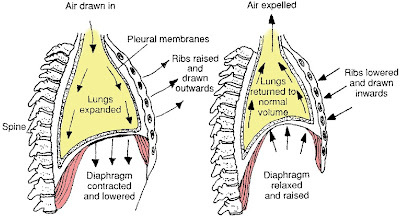 The air is inhaled as before but is then compressed, the muscles around the ribs and the diaphragm working against each other to condense the air in our lungs to create a positive pressure there. The air is then steadily released as the the dialogue is spoken, then after the line of dialogue is finished, the diaphragm is relaxed. This causes the last of the air to empty quickly from the lungs, then we start to breathe in and the process can begin again. 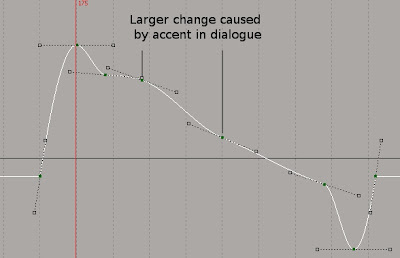 Of course this is not a one way process, dialogue also affects the lung volume - if the dialogue has a particularly loud accent in it, that will affect the lung volume by creating a sudden drop. I've represented this above in my lung volume graph by showing a drop in the curve. As well as loud accents, often 'w' sounds use greater amounts of air and will also cause the above to happen. Now we have looked at this in abstract, let's look at an example. I've selected a clip of Al Pacino from the start of the teaser trailer for Ocean's 13. Al Pacino's breathing is often quite apparent in his performances. I suspect this is because he was originally a stage actor and has learned how to use and exaggerate his breathing to help to project his voice. But in this case, I believe he's using it primarily to drive tension into his voice. "I know people, highly invested in my survival and they are people who really know how to hurt in ways you can't even imagine." First, let's talk about the performance in general. Al Pacino's character Willy Banks, is a powerful and ruthless casino owner and he has just learned of Danny Ocean's plans to disrupt his business. In this shot, he warns him that there would be violent consequences if Ocean carries out these plans. Al's character is incensed at the idea that anyone would set out to damage his business, although the conversation is conducted in public, he doesn't want to draw attention to himself. He's also very clever and doesn't want to reveal that he is affected by this. Al Pacino's performance is very restrained, but it's charged with an intensity which leaves us in no doubt that he is deeply enraged. He keeps his face predominately impartial, at only one point does he let the anger he's feeling creep briefly onto his face - just before he says "really know how to hurt". This is known as a 'microexpression', to do this voluntarily, really shows Al Pacino's acting genius, they naturally occur when someone is trying to conceal or repress an emotion. This one flashes across his face, it is literally only there for one frame, hard to spot when the clip is played at full speed but we read it subconsciously. 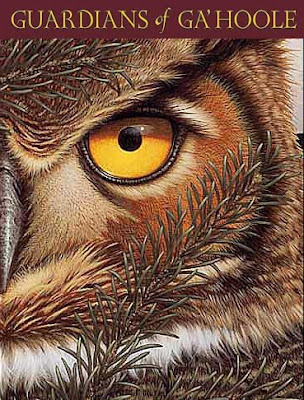 There is a wonderfully subtle texture as well as a change in tempo and tone through the piece. During the first line "I know people" his body is ever so slightly loose and there is a hint of a smile that says "you're joking, aren't you?". Then, as he says "highly invested in my survival...", his body tenses, the speed of his delivery increases and we get that glimpse of anger he's feeling, then at "you can't even imagine" his eyes widen and his speech slows down again to intimidate his opponent by suggesting that he could do something crazy. "I could do something crazy"
Al Pacino's phonemes, like his performance, have been kept small but he's using his breathing to generate as much tension in his voice as possible as well as project what would otherwise be just a whisper. He's forcing as much air as he can through the narrow exit of his voice box. If you watch his throat you can see it tense as he speaks, then relax as he releases the pressure to breathe in. Analysis of Al Pacino's Breathing from Brendan Body on Vimeo. What's interesting is how almost all his movement is initiated or affected by his breathing. You can see his body tensing as he compresses the air before each line of dialogue, then you see his body relax slightly as he inhales. This causes his body to rock backwards a couple of times during this scene. 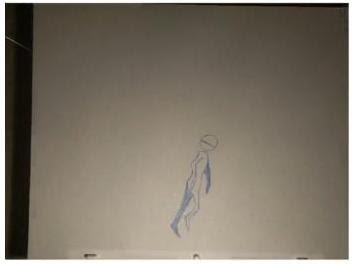 There is only one small body and head movement during "even" that appears to be separate from his breathing. 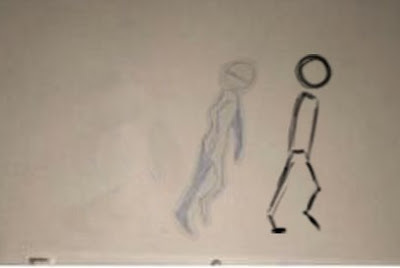 Here is the animation curve of the bar in the movie above. We can see how the breathing pattern we cited above appears throughout the performance, note the way it varies too. We can also see how the rhythm of his breathing echos the intensity in the performance - at the start during "I know people" his breath is slower, drawing out the exhale in his 'almost laugh', but as his delivery gets more vehement during "highly invested in my survival ... who really know how to hurt" his breathing gets faster, shorter and we find small half-breaths. Then during that intimidating last line, we can see how he slows down again. So, how can we use this? 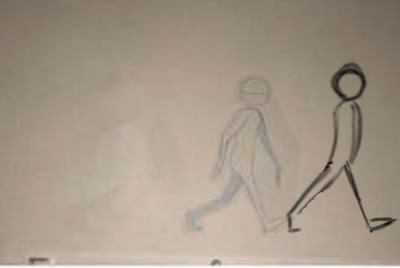 Well, if you were trying to create a subtle performance and wanted to keep the character still, but not so much that the character 'dies', and obviously we don't want the character just floating around randomly, we could base the character's movements around the breathing and can be sure it will work and add to the performance. Also, if you wanted to create an intensity in your performance you could exaggerate the breathing and seek to show the the tension in the body as the character compresses and holds the air in their lungs as they speak. Thanks to James Cunliffe who helped me put this post together. Finally, here's part 2. This is about honesty in acting, and is primarily a method to employ while filming yourself for animation reference and includes an example of my work and some embarrassing clips of myself. Enjoy. 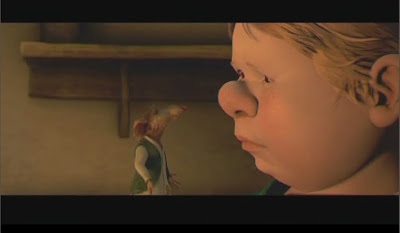 When working on The Tale of Despereaux, we were encouraged to act our shots out and then to show this reference to the director, Sam Fell, before starting to animate. As context is important in the following example, I should give you some back story. A rat called Rosscurro has convinced a servant girl, Mig, to abduct a princess named Pea. Roscurro, through a series of events has turned from a hero to a bitter villain, hell bent on punishing someone, specifically the princess, for the ill-treatment he has received. He has told the naive Mig, that if she abducts Pea and locks her in the dungeon, she can become the princess in her place, when in fact this is untrue and he intends to trap both of them in the dungeon. In this sequence the three characters are walking through the cavernous and deserted dungeons, Rosscurro is on Mig's shoulder and talking into her ear. The terrified Princess, who is bound up and held at knife point by Mig is screaming, and in this shot Roscurro says to Mig, who repeats everything he tells her, "Tell her it's no use, no one can hear her". Here's one of my first takes, I decided at the start of the shot I would look toward Mig, and that for "tell her it's no use" I would try a dismissive gesture, then look toward the princess for "no one can hear her" while giving a fierce point. There are many things I didn't like about this performance. 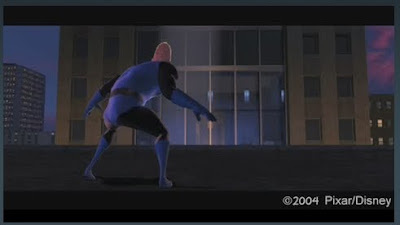 Firstly, I'd given myself too much to do in the time I had (a common animation mistake), and I was struggling to fit in both the dismissive gesture and the point. 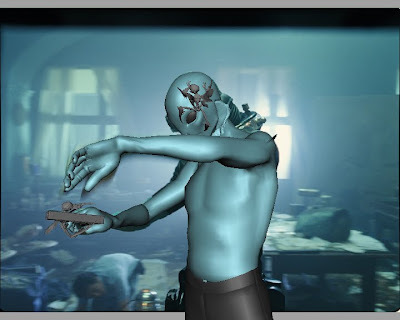 Also, pointing is one of those animation clichés that it's best to try and avoid. This performance was very 'on-the-nose', so I decided to try a different approach. Shooting this was still a valuable experience, as I could see straight away that those ideas were not going to work well. 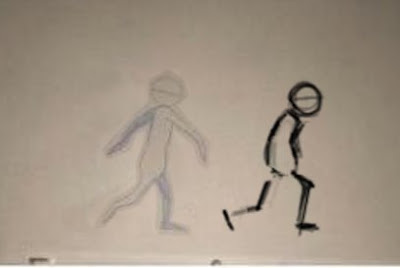 To animate the performance and discover that, would've taken days, here I was able to see very quickly that this was not as strong as I thought it would be. This is footage from another take, this time I decided I wouldn't try to plan what I was going to do, I would just switch the camera on try and put myself in the mind frame of the character and see what happened. I also decided to concentrate on the subtext of the dialogue which was "so what, nobody cares" . When I shot this I thought that I wasn't really doing anything and so this would be uninteresting and unusable, but when I looked back over the footage I was surprised to see I had been doing more than I thought and the performance seemed to work better than the last take. First of all, the action was much simpler - no hand gestures or excess information, but it was stronger for it, my body posture at the end was simple and clear, and seemed to be conveying what the shot was about, bitterness and disinterest. I had turned away from who I was speaking to, this is something I probably wouldn't of planned, it's customary to have your character look to whom they're talking to for clarity, and usually if a character is angry, you'd think that they would stare at the source of their anger. But in this shot, even though he was angry, he wasn't incandescent with rage toward the princess, in fact he was detached and uncaring about her, and her cries for help. Therefore, since he didn't care about either who he was talking to, or about, it made sense that he looked away and clarity wasn't a problem as there was no one else around, a point he was making in the dialogue. I subconsciously, did a little shrug during, "no one can hear her", it was subtle but was something that I could exaggerate in animation. There was also an eye shift around "hear", another thing I did subconsciously but which also made sense for the shot. My facial expression seemed to fit better as well instead of just anger, I had a more specific, surly sneer. Roscuro Block from Brendan Body on Vimeo. Roscuro Final Animation from Brendan Body on Vimeo. As you can see, apart from the adding of the vertical motion of Mig as she walks along, the shot hardly had any major revisions as it went through animation. 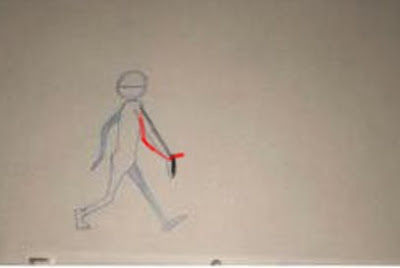 I copied my performance, while exaggerating certain things, like the shoulder shrug as well as attitude in body posture. It was one of the most straight forward shots for me to complete on Despereaux, and although far from perfect, I believe it's one of my most successful. Sam Fell actually commented how strong the attitude was in it, which was very satisfying. 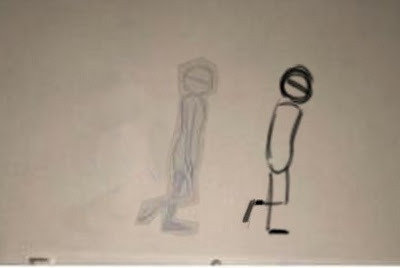 If you've ever tried to film yourself for an animation you're planning, and have had preconceived ideas about what you'd like the character to do, you quickly discover how hard acting is, to keep your mind on giving a performance while also concentrating on what your body is doing is extremely tough. I have a great respect for people who can get their bodies and face to do precisely what they want when acting out reference. Jeff Gabor is a great example, his Horton Hears a Who comparison reel is incredible, his ability to act what he wants to animate is very impressive. However, I find this method, even when done well, can lead to the result feeling unnaturally acted, rather than something more honest. Much better, I think to ignore what your body is doing, try and feel what the character is feeling, concentrate on the subtext, and see what happens. Working on Guardians of Ga'Hoole I'm using this approach a lot, and my lead, James Cunliffe is showing me further techniques, like shooting with the dialogue slowed down or doing a couple of passes, the first one this, sub-conscious, 'honesty' pass then, shooting more reference this time concentrating on the physicality of the performance. 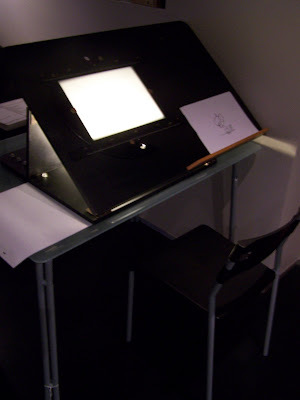 Then you can use both to make a very strong piece of animation ... but more about this another time. I was recently asked by Chetan, a young animator, about acting in animation so I thought I'd post my thoughts here. This was supposed to be just one post but it's got rather large so I've had to break it down into two. This first one is on subtext in dialogue. I was introduced to this term while working on The Tale of Despereaux. Put simply, subtext is the underlying meaning of what someone is saying, not what the words actually are. What we interpret as viewers is ALWAYS the subtext and not the text. An example would be the word 'OK', it can mean many things based on context and the way it's delivered. 5. "I really don't want to do this but OK - I will do it for you"
7. "I am pumped let's go!" "I know he can get the job. But can he do the job? Harry. Yeah, Harry. But can he do the job? I know he can get the job. But can he do the job? I'm not arguing that with you. I'm not arguing that with you. I'm not arguing that with you. I'm not arguing that with you' Harry! Harry, Harry. Yeah, Harry, but can he do the job? I know he can get the job. But can he do the job? I'm not arguing that with you. Harry, I am not arguing that with you! Who said that? I didn't say that. If I said that, I would have been wrong. Maybe. Maybe. I'm not arguing that with you! Yeah, Harry, I know he can get the job. But can he do the job? I'm not arguing that with you! I am not arguing that with you! I am not arguing that with you! Who told you that? No! I told you that! Me! What? Maybe. Maybe, maybe. Maybe!" Text = "I'm not arguing that with you"
"I don't want to talk about this anymore"
Although, this is obviously open to interpretation, there is no doubt that it feels like he is trying to move the conversation forward by changing the subtext of what he is saying. The writer played around with this idea, and there are many scenes in the film where the characters would repeat the same line with different sub textual meaning. "You staying at the hotel?" The characters words aren't saying much but there is definitely a lot going on in these word. The first layer of subtext is that she is trying to talk to him and he is acting aloof. But under the surface, there is a further layer, as we also know that he is pretending to act this way as he knows exactly who she is and what he has to do to attract her. 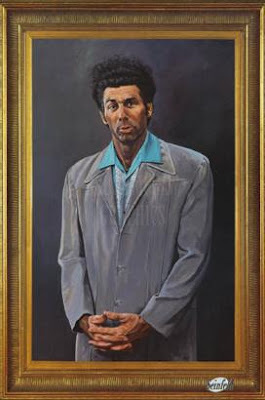 "I'm intriguing, I'm famous and handsome, talk to me." Very clever stuff. The reason this scene is so entertaining is because of the subtext, which is clear in the body language and delivery of the dialogue, and that's what we the audience read, not the spoken words. 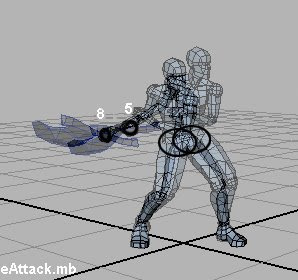 So how does this effect animation? Well this is a very important, we should ALWAYS strive to seek and animate the subtext, and the subtext should ALWAYS be different to the text. 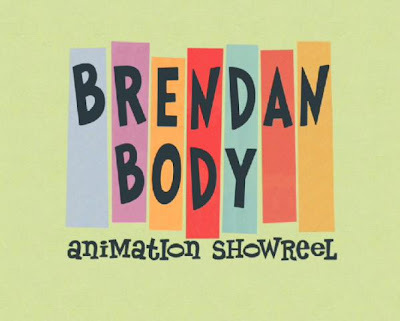 This is so important that for non dialogue shots, Randy Cook would record the unspoken dialogue (subtext) of a shot for his animators to animate to in their scenes. Here's an hypothetical scene - A girl appears from a fitting room and shows a new dress she's wearing to her boyfriend, she asks his opinion, he says "yeah, it's great". If we have his body language mimicking that thought, (it's great) the animation could be fantastic, but the idea isn't very interesting. It's what we call on-the-nose acting, and is just that, acting the words without any deeper thought as to their meaning or what the character is thinking. If the boyfriend says "yeah, it's great", yet his body language says "I'm bored, can we go home now?" we'll have gotten inside the character and given him some depth and therefore created something much more interesting and entertaining. A couple of my good, and very talented friends have their Showreels online, they aren't easy to find so I thought I'd post them here. This first one is from an old friend, Craig Bardsley. I met Craig at Duncan of Jordanstone in Dundee on the animation course, after which we were both employed by Framestore. Craig quickly established himself there with his superhuman ability to animate creatures. His are some of the most memorable shots from The Golden Compass, Charlie and the Chocolate Factory and the Harry Potter films, not to mention the 'birthing shot' from The Children of Men, which I still rate as one of the most breath taking pieces of animation ever. The next one is from James Cunliffe whom I met on Happy Feet, then worked with again on The Tale of Despereaux, and he's currently my Lead on The Guardians of Ga'Hoole. James is great at physical animation but his real strength is his acting, his ability to give a film's quiet moments an intensity and honesty is second to none. The animation course I taught at last year has just had their Degree Show, a website with all the students' films is available here. 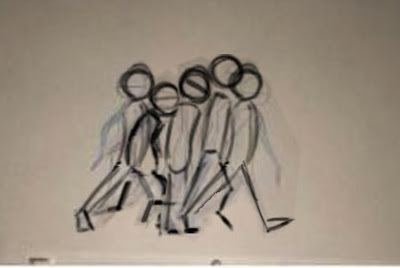 Watch out for animator Chris Seed, his film 3hirty Six (pictured above) is well worth a look. Well done everyone. For those of you that gave me a mention in your credits, thank you, I'm very flattered. Apologies for the lack of posts lately, I've been rather busy at work. 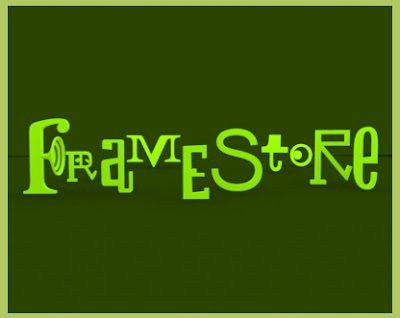 It's my take on a lecture shown to me by my animation supervisor, Michael Eames, when I first arrived at Framestore. 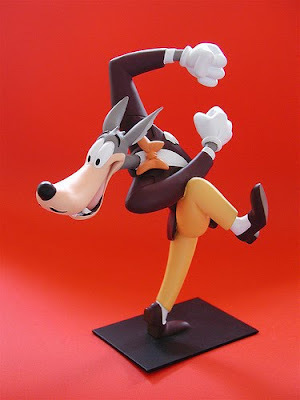 He received it from Phil Nibbelink when working on the film Balto, who in turn, was taught this by Disney's Frank Thomas. Oh, and if anyone knows how to make movies exported from Quicktime pro loop, please let me know. Jeff Baker is a multi talented draughtsman, concept artist and lead animator at a game studio who got in contact with me and asked if I could critique some of his animation. His blog can be found here, I've decided to comment on his "axe attack" animation which can be viewed here. After looking at his previous animations, he seems to be moving in the right direction, learning fast and improving greatly with each test. 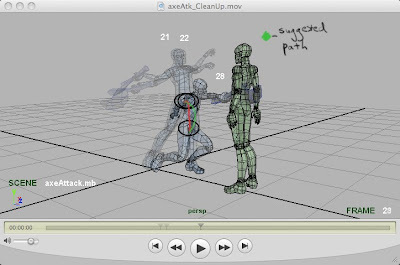 The axe attack is very dynamic and predominantly a well executed piece. Jeff seems to have a good eye for poses, I especially like how the axe follows a nice arch over the character's head. However, a pose I would consider altering is the one around frame 33. The head at this point feels a little unnatural and when viewed in motion, it seems to be fighting the movement of the body. I've drawn a suggested position, and from another angle to make sure it's clear. I'd also consider having it reach this position later than the chest and hips, then perhaps have it rotate back before the rest of the body, this would lead into the next action. 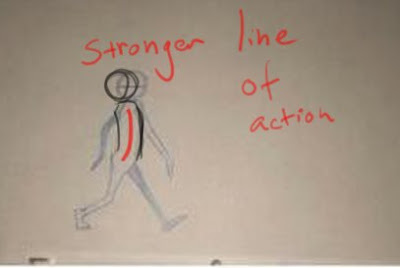 The main issues I've found in the animation are to do with weight and inertia, I think if you concentrate on learning these principles it will really help your animation. The way I think about inertia is quite Newtonian, "A body persists it's state of rest or of uniform motion unless acted upon by an external unbalanced force". In other words, objects cannot change speed or direction without being pushed by something else. Gravity always acts upon us and we know if we throw a ball up in the air, our hand at first acts against gravity pushing the ball up, but from the moment the ball leaves our hand, gravity will make the ball decelerate and eventually make it change direction and accelerate back toward earth. Importantly, an objects horizontal movement is not affected by gravity and has to be accelerated and decelerated by other forces. I'm sure that all sounds pretty obvious and straight forward but let's try and implement that in our character. The first place I'd do this is on the character's hips, specifically when he jumps toward the other character. 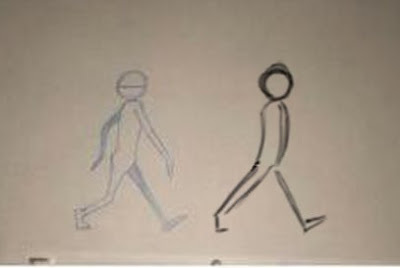 From frame 15, the character's hips are accelerating forward and up by pushing against his right foot until frame 20 when this foot leaves the ground (I like that you've let this foot slip back slightly showing the force of the hips in the opposing direction). At this point no horizontal forces are acting on his body - his body should be moving forward at a constant speed while his vertical motion is responding to gravity. 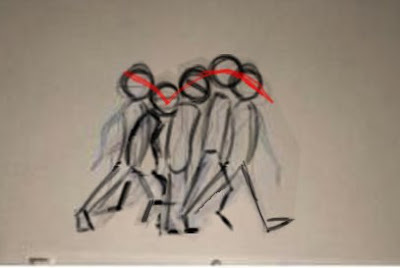 Then on frame 21 the hip movement suddenly comes to a halt, and then translates down. This seems to me unlikely as his foot has only just made contact with the ground, we need time for his leg to push against the momentum of the body. I would suggest that the hips continue to move forward after the foot contacts the ground for a few frames, with each frame the movement getting less, showing the leg and foot pushing against the hips, slowing them down. This forward movement would also provide a reason for his head to rotate back. Unfortunately, you'll need to alter the foot positions to do this. This theory would also effect when both heals twist between frames 04 and 14. If we try and act out this movement we quickly find that it is not possible, we have to move the weight off one foot in order to twist it. 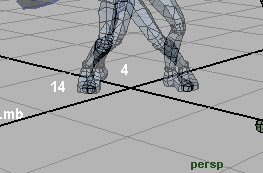 So, this would work better if he first started twisting his right foot just before frame 4 when his weight is over the left foot, then he twists his other foot as his weight shifts to his right foot. 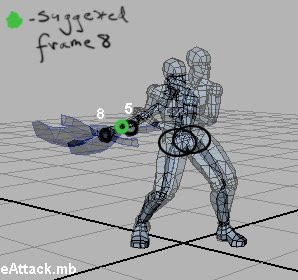 Between frame 5 and 8 the axe and the body move backward at the same time and speed. If you delayed the hand as I have suggested, this would make the movement feel a little more organic and would add a little weight to the axe, which then leads me on to a bigger problem. 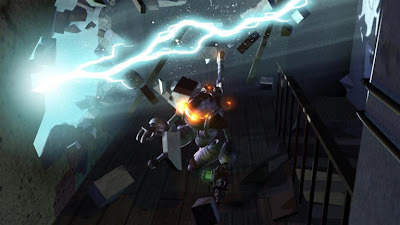 My overall impression is that the axe feels too light and if this character were wielding an axe of this size, he would not be able to perform the movement you have created. This is an easy mistake to make, I always try and find some reference to help me animate. Check out this footage of a lumberjack competition. The axes these competitors have are much smaller than the one in your animation, yet they feel much heavier. I'm not saying copy this swing action but you can certainly take things from it. 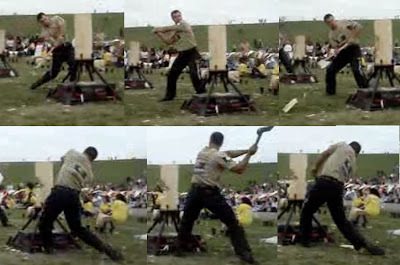 The competitors use two hands to swing the axe, spreading them apart to lift and aim the axe. They also keep their feet fairly planted on the ground, although you can see moments when they have almost no weight on a leg by the way the knee wobbles around. They don't jump toward the wood, their movements are quite limited, yet they still strike some very dynamic poses. My overall advice would be to possibly replace the large axe in his hand with something smaller and lighter - perhaps a sword. This will mean with a few alterations you'll turn this into a great piece. 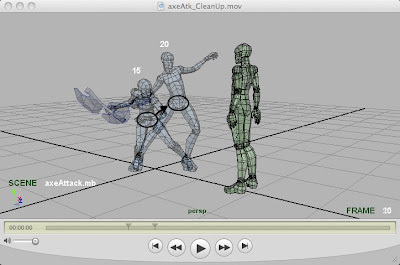 Then if you want to do an attack with an axe of this size, possibly have a look at some reference, and/or act the movement out with something really heavy. Then animate it concentrating on figuring out how the character would push and be affected by swinging around such a heavy mass. 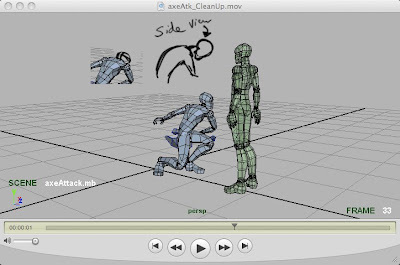 Hope that helps, as I said before I was very impressed by your animation and think with a little more weight your stuff could be amazing. Here is my first attempt at traditional animation in a long time. I decided to try a turnaround of The Brain from Pinky and The Brain. Because I feel a little rusty, I thought I'd ease myself into this gently, so I just concentrated on keeping the same shape and volume in the character and ignored the mechanics and acting for the moment. 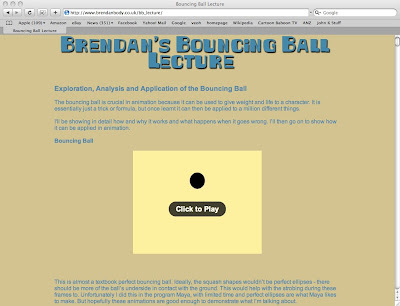 The Brain Turnaround from Brendan Body on Vimeo. This test has been put to one side rather than finished. I might go back and fix it later but I feel like I've learned a lot just getting this far, forcing myself to think about turning these shapes around in space. The limbs and facial features are wobbling much more than I would like, and I've made a visible error with the position of the body in one of my keys. However, I am reasonably happy with the cranium, as it holds it's shape and volume quite well. I found The Brain quite a hard character to draw, as his proportions and shape are quite unusual. His head in particular is tough, because it's not a simple sphere or oval like many cartoon characters. I used this model sheet, thinking this would be a solid basis for the exercise, but it actually led me astray in a number of ways. 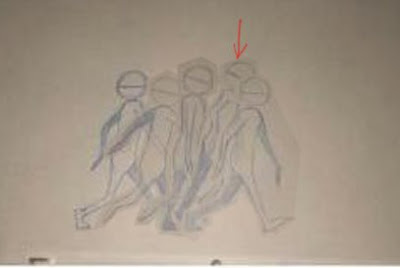 The feet are in a different position in each drawing, and also the ears change shape and position on his head. 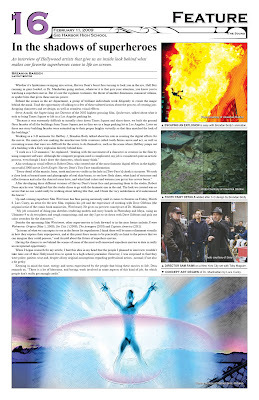 Here is a shot I worked on from the film Hellboy 2 : The Golden Army. 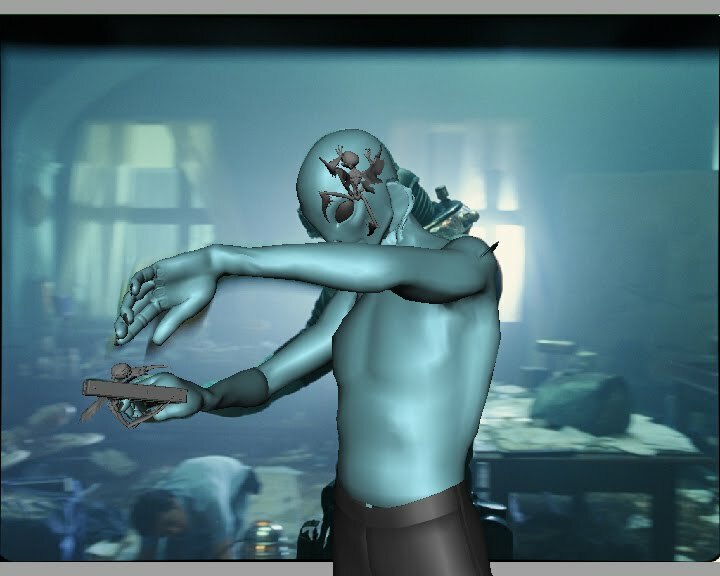 In this sequence, the character of Abe Sapien is being beaten up by the much bigger Mr Wink, but the action is partially obscured by a screen. Abe and Wink Fight from Hellboy 2 from Brendan Body on Vimeo. I thought it would be fun to show some of my playblasts that reveal what's going on behind that screen. Playblasts of Fight I animated from Hellboy 2 from Brendan Body on Vimeo. My initial version of this shot was much more realistic, with Wink punching Abe more and throwing him around much less. When it was reviewed by the director, Guillermo del Toro, he asked for something more extreme, wanting Abe to be thrown around like a rag doll. Specifically citing Bam Bam from The Flintstones (when he used to throw Fred around) as an example of the action he wanted. 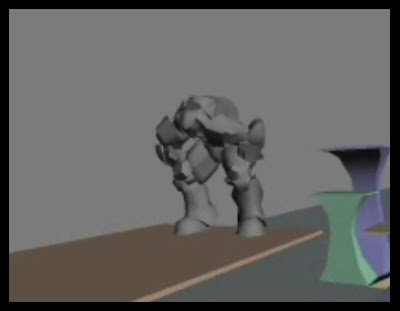 These playblasts are not the finished animation, I animated this block of the fight, and the animation was finished off by another animator, Ina Hurst.